One thing I particularly love about a real Bolognese Sauce is the inclusion of carrots and celery in the tomato sauce along with the meats that include a pork and beef combination of some sort. But then the key is the bit of cream and wine that soften the color into the creamy red sauce we love to eat: Bolognese! This easy to make combination is so good, you can eat it without pasta, yet with a penne or spaghetti of your choice, this is a full one dish meal served with a green or Cesar salad. Make it ahead and keep refrigerated for up to 4 days or freeze it air tight for up to 3 months. Get ready to enjoy this dish often! We are always looking for delicious and unique appetizers to serve as guests arrive and start to enjoy time together before the dinner or lunch is served. Here is one that you will repeat over and over again. You can make it with crab or tuna. We prefer tuna! Make ahead and store in refrigerator for up to 5 days in advance. Warm and serve just as your guests arrive. Can be served room temperature as well. Serve with pita bread, crostini, chips or crackers. If you are looking for a special treat for your Valentine’s Day dinner or weekend celebration, we have a cookie that will make your honey smile and then savor every bite of this coconut-rich, gluten free, sweet treat! We are showing the gluten free version of the recipe, but you may substitute white flour if you wish. Either way this is a shockingly easy cookie you will make over and over again with the variations we have provided! On a visit to Pawleys Island in South Carolina, I was served this incredible egg dish by our friends Mark and Ginny. I watched as Mark filled an individual ramekin with cream cheese, a cracked egg, basil and cheddar cheese. I was fascinated with how he then poured boiling water into a roasting pan, placed the individual ramekins into the water and baked the eggs to a delicious mixture of tastes and textures. This is my new favorite egg dish! Served in a ramekin or a small mason jar, this breakfast will surprise your guests. Toast served on the side will help with soaking up the egg yolk and cheesy sauce. Get ready for a morning burst of fun and surprise your family and friends like I was! The recipe has been adapted from a friend of Mark’s, Jennifer, who found it in a 1969 edition of Sunset Magazine. It is further adapted here by Two Friends in a Kitchen. 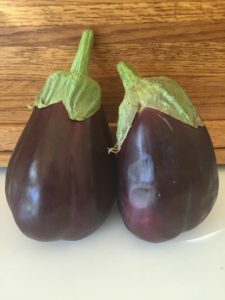 Magical Foodlore Moments: Eggplant – Who Would Have thought? I have to be honest and say that eggplant is not my favorite vegetable UNTIL Linda taught me otherwise. She makes a great eggplant lasagna and she makes great roasted eggplant. But with this latest recipe she has outdone herself! Our Two Friends Thai Eggplant and Red Pepper Stir Fry recipe is another crowd pleaser. So easy and so yummy it will become another go-to vegetable dish in your family. When served over a bed of rice, it becomes a delicious main dish! Check out the recipe on our website at: http://twofriendsinakitchen.com/recipe/thai-eggplant-and-red-pepper-stir-fry. Of course there’s a magical foodlore story to go along with this recipe. Linda and her husband Tom love to garden. Every year they plant eggplant and every year their garden prod uces perfectly shaped and gorgeous purple eggplants. 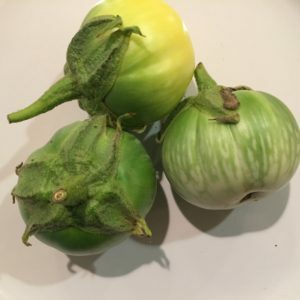 This year, however, they kept waiting for the eggplant to turn its vibrant purple, but instead as they checked their garden day after day, they continued to see these small, round, green ball-shaped plants. Being her usual curious self, Linda did a little research and found that the eggplant they planted is actually called Thai Eggplant. It never turns purple and it tends to be much more roundish in shape than your traditional eggplant. She also found that they are sweet and delicious! Well, never wanting to waste a vegetable from the garden, she whipped up this amazing stir fry recipe to share with all of us and of course it was truly an amazing combination of flavors and textures that melt in your mouth. So, the moral of this story is, “don’t be afraid to pick up and experiment with a new vegetable you discover at the farmer’s market, at your grocery store, or even in your own garden.” You will be glad you did! As always, when you try our recipe, let us know what you think. If you have used Thai Eggplant in a recipe in your kitchen, we’d love to hear about it! 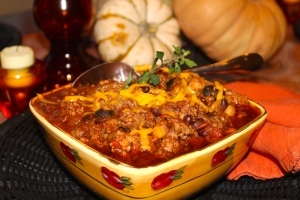 Halloween and Chili – a Great Combination! There will be ghosts, goblins, witches, glowing pumpkins and little children dressed in adorable (or scary) costumes for Halloween! This year in California, there will likely be rain as well on Halloween night. But that doesn’t stop us; in fact, we love the rain! We now have a great reason to bring out our “Three Bean Chili” recipe. This one, like so many others, is a neighborhood favorite. Just follow our simple recipe and you will have the best chili EVER! Whether it’s your children or your grandchildren going out for Halloween, or you invite some neighbors over for a bowl of chili before you all set out for Trick or Treating, this chili is sure to delight. Our Three Bean Chili is a meal in itself or you can serve with garlic bread or over a bed of rice. If your Halloween night is a quiet one, no worries, leftovers freeze great for up to six months. Happy Halloween and Happy Trick or Treating! This is not the minestrone you may have had before. This is a thick, rich soup with a pureed bean base. The secret is in processing the beans into a paste which is built upon with chicken or vegetable broth and a collection of vegetables and spices. Our families can't get enough of this soup. It becomes a meal when meat and pasta are added. Your children will be eating vegetables you never thought they would eat when you serve them this soup! This recipe is one of the amazing soup recipes in La Cucina Marinello cookbook which you can purchase on our website at www.twofriendsinakitchen.com. As soon as Fall arrives, we know it's time for our East Indian Chicken Curry Soup. If you love curry, you will love this recipe. The flavors merge in such a magical way, it's hard to isolate exactly what the key ingredients are. With this recipe, we reveal our secret to another easy-to-make, hearty, flavorful soup you just can't get enough of. This soup is delicious with homemade (or store bought) Naan or crusty bread. The recipe makes a good size batch, so feel free to freeze your leftovers or just eat this great soup throughout the week - you won't grow tired of it! It just keeps getting better. This soup is one that Joan (Linda's sister) learned from her friend Jeannie Carr, another fantastic cook in her own right. Jeannie invited Joan over for lunch one afternoon and served this soap with a simple green salad and crusty bread. Joan was hooked and has been making it on a regular basis every since. The soup is much like Grandma’s Meatball Soup but differs with the addition of tomatoes, making this a tomato based soup. It is perfect for a meal by itself or a starter. This soup is also great leftover. Joan usually makes a big batch and uses it all week long.